09 August 2018 – Cobham SATCOM maritime antenna systems will be powering the digital connectivity on 16 dredging vessels that support the One Belt One Road Initiative, China’s ambitious port and infrastructure-building project covering much of Eurasia and parts of Africa as well as its new Polar Silk Road initiative. 16 SAILOR 900 VSAT antenna systems, via partner Beijing Highlander Digital Technology Co. Ltd are due to be rolled out on the ships owned and operated by CCCC Dredging Company (CDC) over a period of 24 months with an option for a further six vessels. The new VSAT equipment will replace the vessels’ existing FleetBroadband communications hardware. China’s dredging industry has undergone a massive overhaul over the past 20 years, resulting in a significantly expanded and more technologically advanced fleet. More than half of this capacity is owned by China Communications Construction Company (CCCC), which today operates around 40 trailing suction hoppers, 60 cutter section dredgers and almost a dozen bucket dredgers. Vessels are engaged in port construction, channel widening and land reclamation projects throughout Asia and in Africa and South America. The latest ship to join the CCCC fleet is Tian Kun Hao (天鲲号), dubbed a ‘magic island-maker’ by its designer, was launched last year and is due to enter service this summer. It is the first fully domestically-built self-propelled dredger of its type in China. The 140m-long cutter section can dredge up to 6,000 cubic meters an hour from depths up to 35m and thanks to an automatic control system can be operated without any crew. Dredging operators like CCCC are increasingly turning to digital solutions – particularly real-time monitoring and automation – to improve dredging efficiency. Increasing regulation and a push for greater transparency are also major drivers. The gathering and remote analysis of vessel operational systems and drilling equipment can be used for predictive maintenance, aid decision-making and ensure smooth project execution. Together such developments have seen a surge in ship-to-shore data volumes, placing greater demands on on-board satcoms infrastructure. SAILOR 900 VSAT antenna systems come factory-tested, balanced and ready-to-go with standardised high-performance RF and the requirement for only one cable between antenna and equipment below-deck. 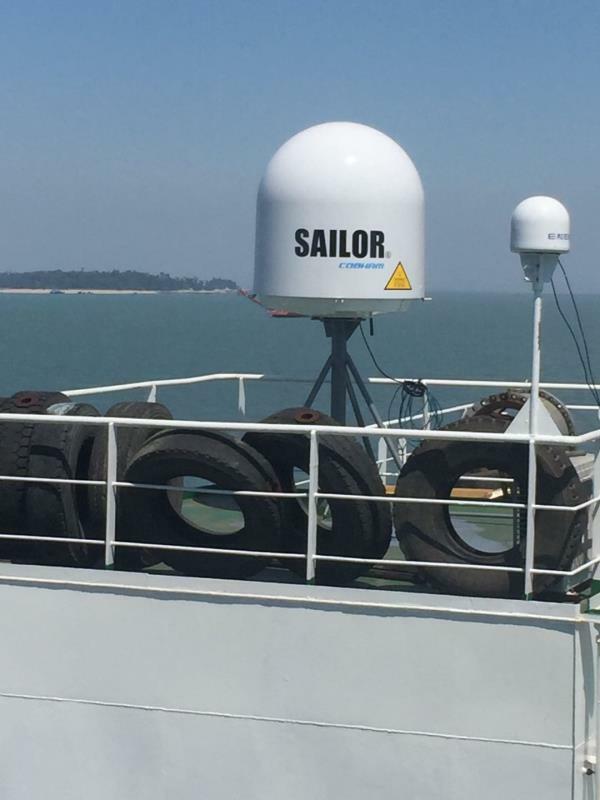 The approach saves time and cost, and combined with operational reliability has positioned SAILOR 900 VSAT as the highest productivity Ku-band antenna on the market. The system has been tested to work on HTS services, including Intelsat’s EpicNG, and is prepared for conversion from Ku- to Ka-band operation on services such as Inmarsat Fleet Xpress.